Are you looking for an easy gift idea for a special person in your life? My dear sister’s birthday snuck up on me….or more importantly I was stumped on what to do. Fortunately, I remembered how easy and darling a custom diy sharpie mug is. My sister, being a tea lover, definitely could use another tea mug besides the fact they’re super easy to make so away I went to get my supplies. 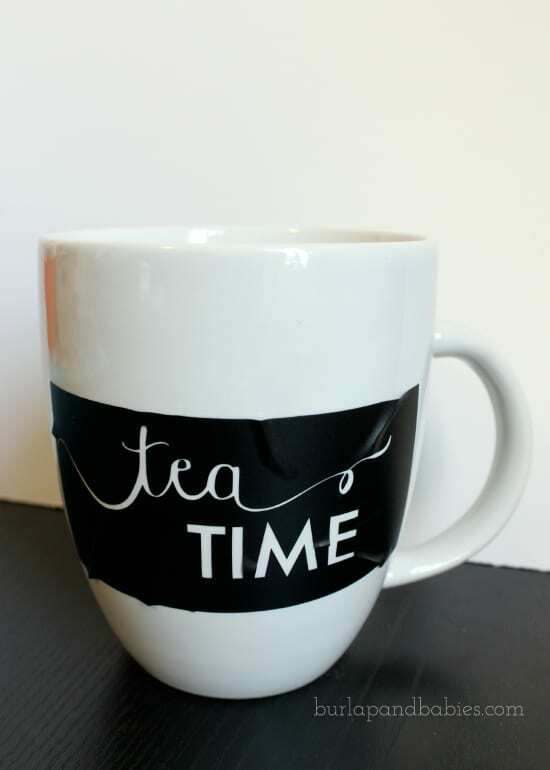 All you need is a mug, sharpie, and some creativity. You can find these simple white mugs at Dollar Tree so definitely a steal of a deal! UPDATE >>> You can find porcelain markers now at your local craft store that are perfect for this job. First, decide what you want on the mug. Seriously, this was the longest part of the entire process!! Besides waiting for the oven to preheat if you forgot to turn that on (like I did!). I cheated and cut vinyl using my Silhouette Cameo just to have clean lines but you can totally freehand it if you feel comfortable with your skills. Please note that if you use vinyl on a curved mug then you might run into some difficulties with the vinyl not laying flat like mine so just be careful. Once you’re done decorating your mug, put it on a cookie sheet (or directly on the rack like I do) and bake at 350 degrees for 20 minutes. This is to help set the sharpie and give it a more glossy finish. Once it cools down, add some little gifts to the inside and you’re done. 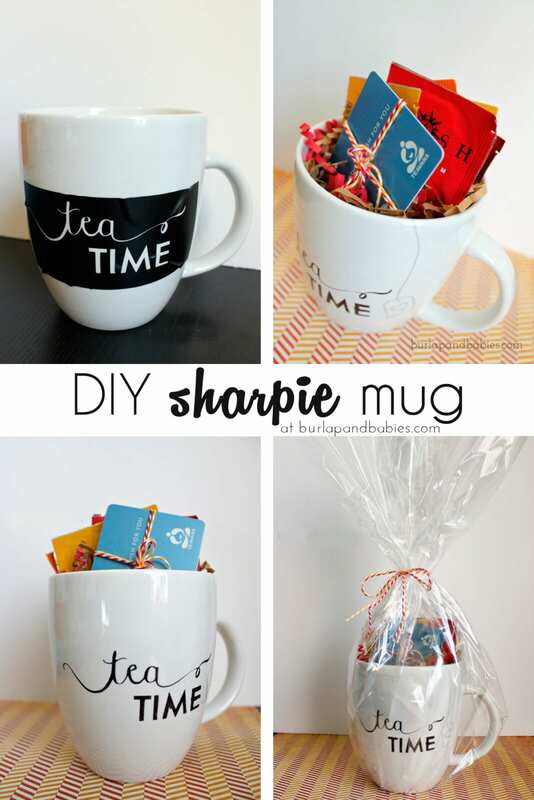 A personal, DIY sharpie mug specific to someone special in your life. 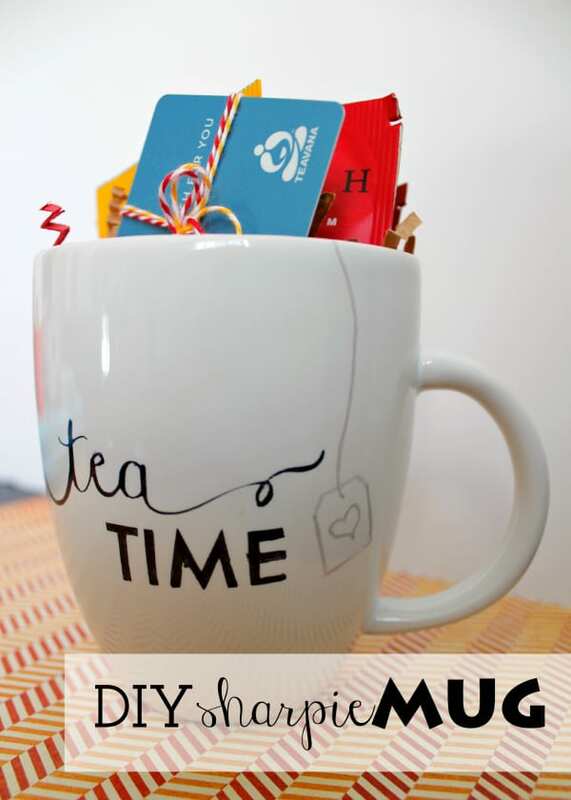 And of course, who doesn’t love a giftcard to Teavana too! If you’re giving this as a gift or just for yourself, I highly recommend only hand washing. The dishwasher will wear it down much quicker. 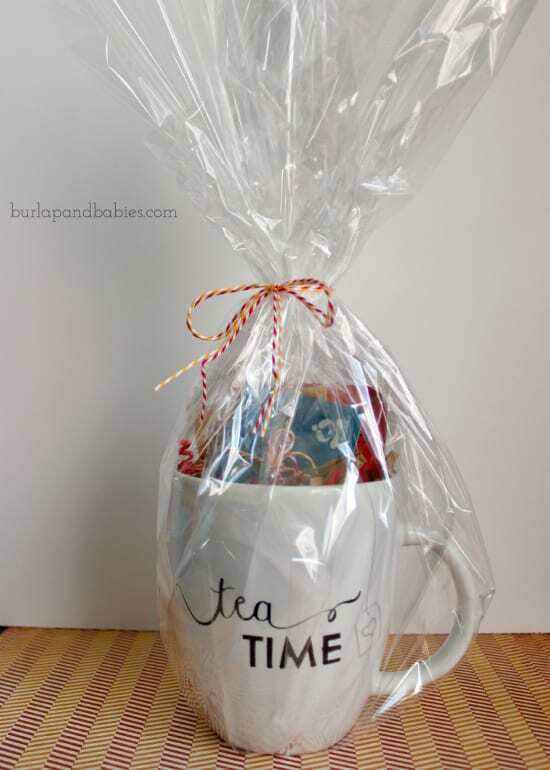 If you’re giving it away as a gift, a little cellophane wrapping and some baker’s twine is all you need to put it all together. And voila! You’re done. 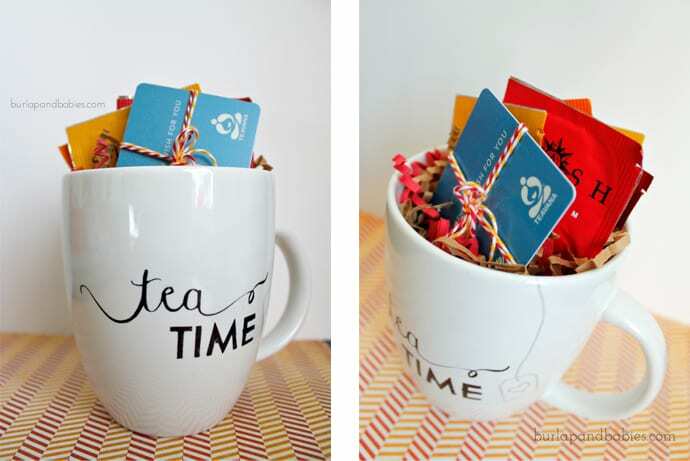 A super easy DIY sharpie mug personal gift completed from start to finish in under an hour. If you love this easy gift as much as I do, I’d love if you shared it on Pinterest or Facebook using the share buttons below! I have tried this technique both with a regular sharpie and an oil based. The oil based lasted longer but I found after a few weeks of washing the sharpie came right off. Is there a way to make it more permanent? Have you run into this issue?